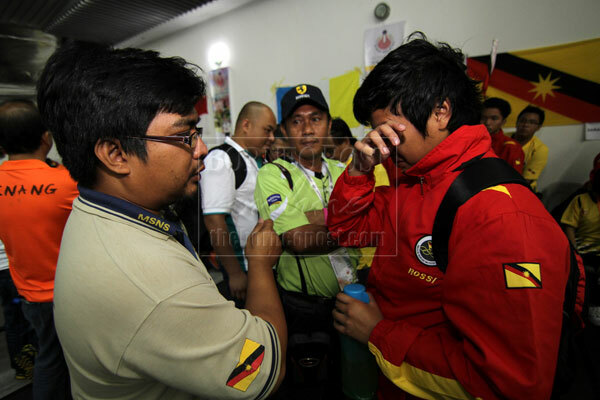 FRUSTRATION: Sarawak’s fencer Nur Jannah being consoled by her coach Muhamad Fairuz Ibrahim (left) after she lost her match in the quarter-finals yesterday at the Gymnasium 3 of the Bukit Jalil Sports Complex, Kuala Lumpur. KUALA LUMPUR: Sarawak have yet to get into the medal tally on the third day of Sukma XVI when all the state’s fencers were eliminated in the early stages of the individuals events while the women judo team also drew a blank. The state only entered one women judo event, the kata competition, but its pair of Bong Li Qing and Chang Bui Kiun missed out on the medals when they finished fourth.. There was further bad news in cricket when Penang beat the state team by seven wickets. Before the match, coach Chew Pok Cheong had warned that Penang would be a tougher nut to crack than Perlis the team Sarawak beat in their opening match on Friday . In softball, Sarawak played two matches at the UPM softball field yesterday where the men’s team narrowly lost to Perak 5-6 while the women’s team was thrashed by 0-9 by Terengganu. However, it was not all gloom for the state contingent yesterday as two of its bodybuilders Mohd Alrzrin Abdul Ghani in the 65 – 70kg category and Azri Asmat Sefri who competed in the under 60kg category made it through the pre-judging stages to enter the finals today. Manager Oddie Grinsam commented that he was pleased that both qualified for the final round and hoped they would make it to the podium in the finals. The other spark in an otherwise in an otherwise dismal day was the victory of the volleyball men’s team over Pahang despite missing two key players. Sarawak will be competing in eight events today namely bodybuilding, basketball, cricket, softball, fencing, judo, kabaddi, artistic gymnastics and volleyball.